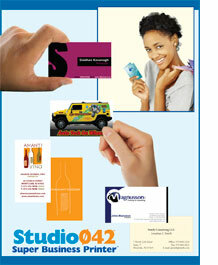 Studio042 offers three different types of business cards depending on your individual needs. Rapid response digital business cards, Full color business cards and Traditional thermographed cards. See the chart below for the various quantities, paper stocks, price breaks and turnaround times available for each type of card. At any time you can upload your files by clicking on the “send a file” button on the right side of this page, or mail them. † Does not include the design/creative process. ‡ Typical turnaround. Actual times may vary. Easy to find on Bloomfield Ave. Street parking, or use parking lot behind building.